This time of year is bursting with beautiful and vibrant winter squash. Pumpkin, acorn, butternut and spaghetti squash provide an excellent source of carotenes. 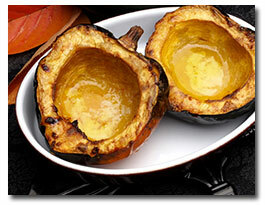 Typically, squash richer in color provide a greater concentration of vitamins and minerals. Winter squash are actually a warm weather crop. They get their name from the fact that they can be stored through the winter. Very good source of vitamins B1 and C, folic acid, fiber and potassium. Good source of vitamin B5. This water-soluble vitamin acts as an antioxidant. Good source of vitamin B6 and niacin. Protective effect against many cancers, particularly lung cancer. Protects against heart disease and type 2 diabetes. Pumpkin seeds are helpful in reducing symptoms of an enlarged prostate. Carotenes help to protect against the damaging effects of the sun. Ring them – Cut into rings about 1/3-inch thick (the skin is edible) and sauté over medium heat about 6 minutes. Turn and cook on the second side until tender. Stuff them – Smaller squash like acorns make their own little bake-and-serve dishes. Make Soup – Roast a butternut squash in the oven and then scoop out the flesh. Puree it in a blender, thin with some stock and season to taste. You will have a tasty squash bisque! 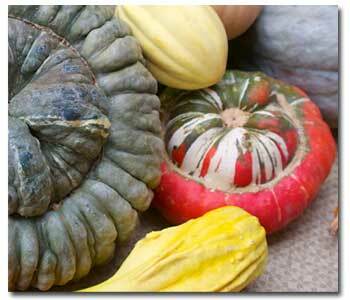 Learn the differences between Summer and Winter squash and gourds.